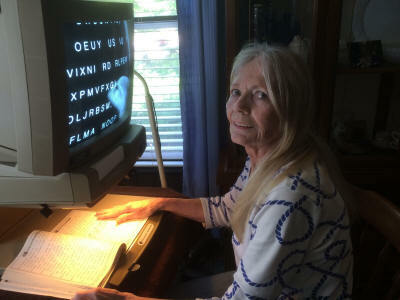 The Fond du Lac Evening Lions Club placed another optical reader in the home of Fond du Lac resident Candy Searvogel. Her sight has deteriorated due to Macular Degeneration. She needs to sort her husband's pills and take care of family business due to her husband's multiple heart attacks. When she sat down at the reader, she exclaimed, "This is so wonderful, it is just like Heaven." Lions help individuals who need assistance with purchasing expensive items so they can function like people with full vision.